...with your willingness to own your magical gifts and join us in sacred circle.. This journey is about sacred work. It's about strengthening our connection to our essence and living from Soul. The Priestess Power Path is a CALL to deepen our relationship to our spiritual path, awaken to our magic and listen to our inner light. 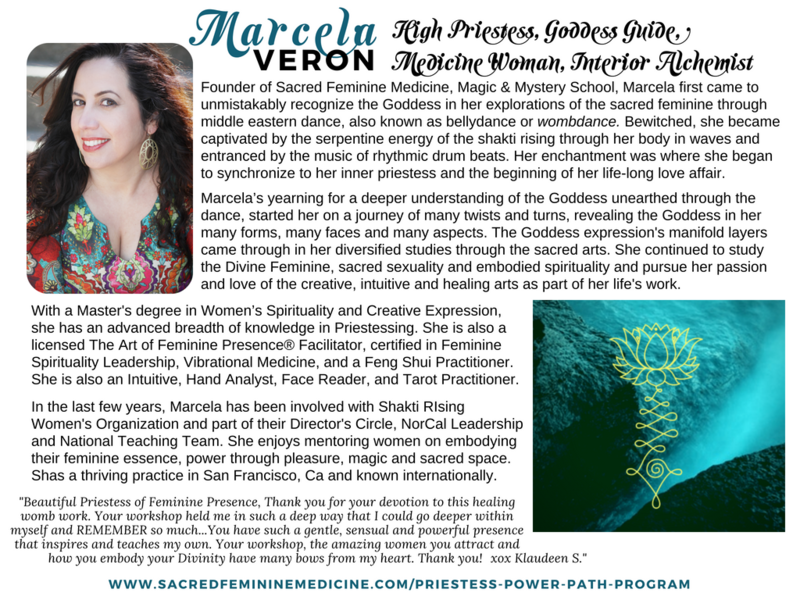 If the word Priestess draws you in, then welcome to the magical journey into Priestessing where you will learn how to connect to the magic and heart of your feminine soul, access your intuition and praise your unique gifts. She is a steward of the divine feminine. Through the sacred arts, she finds her medicine, engages in magic, and calls forth the mystery. Will connect you to your mystic self -- your wisdom and your knowing. Your inner priestess is here to engage in the dance by enticing the mystery and tuning into the real feminine mystique and what you are to embody, learn and teach. The mystic self calls upon you and asks to let go of distraction. She hands you the Divine Keys to tune into and access this soul enriching journey that will guide you in grounding, presence, dance, embodying, exuding, attuning, vibrating and pulsing… LOVE... Deep love. She listens to your inner pulse, guidance and magic. This potent path will teach you ways to follow your rhythm and your guiding light. A Priestess learns the power of the sacred arts and to listen and follow divine guidance. She learns how to own and hone her clair-abilities to not only benefit from but to guide others in ways that deepen their connection to the divine. She learns to listen to the rhythms of her soul, the cycles, the moon and creates magic. She is not afraid to go into her darkness and her shadow to find her light. She can be a medicine woman, a shaman, an energy healer, a teacher, a dancer or any woman that wants to connect to her divineness. What makes her unique and a Priestess is that She is a steward of the divine feminine. Through the sacred arts, she finds her medicine, engages in magic, and calls forth the mystery. She is a midwife of the rebirth of Divine Feminine, Goddess, that has been partially hidden, overcast, underground or under appreciated. The Priestess Power Path is one that will help rebirth her into her full glory within yourself, in women's circle and in your community. Calls forth the intuitive creative arts in ways that spark the beauty of embracing, engaging and embellishing ritual that impassions the spirit into sacredness. This Priestess Power Path Program provides practices to embody your inner beauty, your essence and presence for long lasting endurance and is empowered by transformational way of living… the power of self-possession. The Priestess Power Path calls you to claim your body temple. Messages and rituals come through presence, sacred movement, drumming, music, dance, art, inspirations and reverberations. The body knows the way and it is into their essence that women need to be living in their body, their womb and in the heart of the moment. Women are returning to the drums and back to its sacred power. We are reclaiming our sacred connection to the rhythm of life, our body and of our soul. We are reclaiming to what belongs to us and so desperately need in present culture to return to the reverence when the devotion of women was the natural way of life – in tune with all life. We are claiming the Power of the Priestess within! The spiral inward becomes a beautiful and poignant journey into the chrysalis of your feminine soul. Alone, it can be heart-wrenching. Witnessed, it can be soul beautifying. With others, it can be soul illuminating. ​The journey back outward becomes emergent freedom like receiving magnificent butterfly wings. Let me be your guide in your personal heroine's journey. Sacred Feminine Medicine, Magic & Mystery. Through this spiral dance journey, we will walk alongside your personal Goddess, Animal, Crystal and Plant Medicine while gathering your priestess tool box. To begin your path, you will receive a personal magic gift divined. 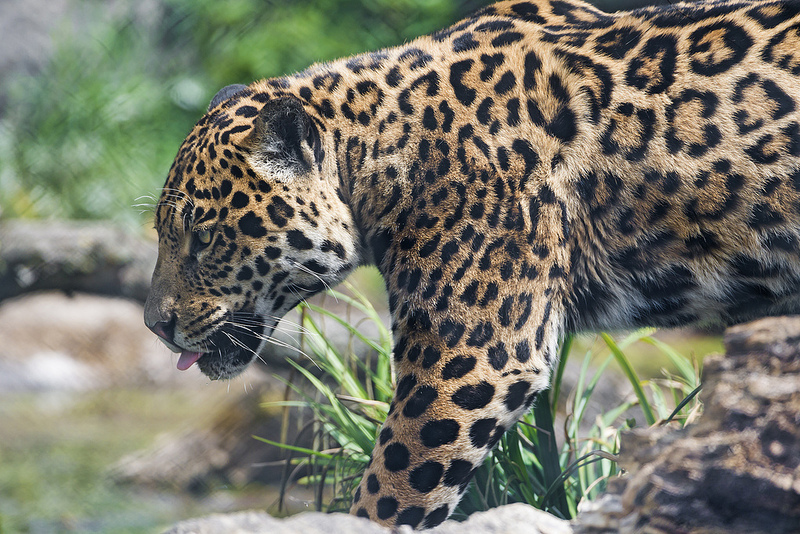 West Coast Jaguar Circle & East Coast Panther Circle. a personal magic gift divined. *Priestess Power Path Online Forum for connecting, curriculum, sharing, recordings and updates. Complete program, which includes all 4 Seasonal Retreat Intensives, all Online Classes, Special Forum, Rituals, Curriculum + 6 Private Sessions! ​Extra Full Day Live Monthly Priestess Power Path Circles in San Francisco area on the first Sunday of the month beginning in October 2018. = additional $1000 full pay OR $89 added to your payment plan OR $100 per each monthly circle. ​Extended Retreat Day added to each of the 4 Retreat Intensives. Includes extra night from Sunday evening to Monday after each of the intensives. = additional $1000 full pay OR $89 added to your payment plan OR $265 per each retreat intensive separately"
In the many women circle's that I have led, the women felt the call to step up to reclaim their essence, They listened to the whispers that it was time to say yes to their inner knowing, claiming in their own way that they were ready to receive a boost of transformational power and to step into their spiritual path. ​The remarkable thing is... that before this journey there was something in each woman that was holding her back, holding her from fully feeling her essence and expressing her true self. Or she needed help in shifting some old patterns to help her feel more deeper into her soul for more joy and fulfillment while experiencing more intimacy in her life and relationships. She needed some situation shifting! She needed help in receiving more love... feel more love and REAL love for who she really is. She wanted to be WITNESSED in their feminine magic and seen for her true beauty. She needed to claim her feminine soul! Align to your feminine soul and Activate your Wild Woman.